Painted on location in cold and rain. Wearing shorts and a short sleeved shirt, because I did not plan ahead! I love Roman stuff. 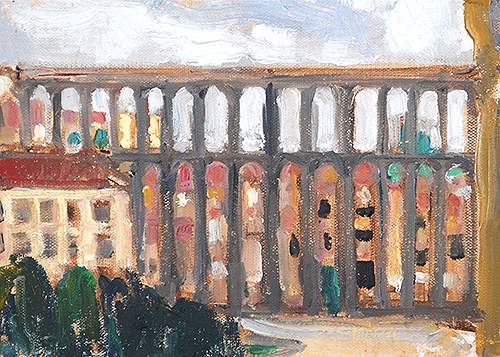 This entry was posted in Landscape Paintings, Urban Landscapes and tagged 5 x 7 inches, aqueduct, landscape painting, oil on linen on panel, plein air, Segovia, spain on September 26, 2018 by Kevin.